The borders are done! The first patch on my quilt about time was stitched on January 1st, 2014. 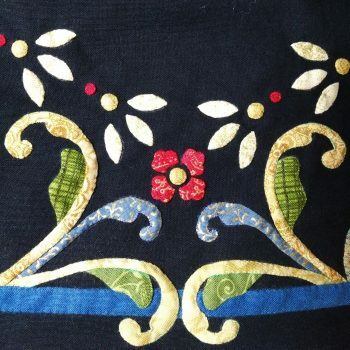 The final patch on the outer border was stitched on September 22nd – the first day of fall – so I came very close to meeting my goal of completing the appliqué this summer. There are fifty-five patches, repeated sixteen times, for a total of 880 patches in the borders. You know you’ve done a lot of sewing when you run out of thread! 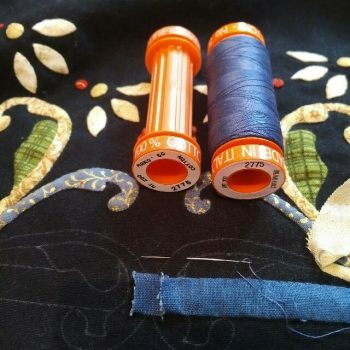 That’s 200 meters of Aurifil 50-weight cotton color #2775. Although this is a significant milestone, the appliqué is not completely done. I have been working on this quilt in four sections and some of the motifs cross over the future seam lines. Once the quarters have been pieced together, there will be a fair bit more stitching to do. But the next step in the project will be designing the quilting motifs. It will be much easier to trace quilting lines onto the background and to add any trapunto details while working with the smaller panels. Then it will be time to piece, finish the appliqué and quilt!